American metal, yes. After that this is almost impossible to define. From the off, with ‘Fall of Ancients’, there are elements of thrash, power metal, death metal even epic sweeping sounds more akin to Blind Guardian or similar. The production is stellar, the musicianship superlative. There is lots of melody, too, with tracks like ‘Origen Adamantius’. The vocals are soaring, and feral in the same song- going from Manowar-esque bombast to death metal extremity in seconds. ‘The Recruitment’ demonstrates this perfectly. The drums, played with absolute dexterity by Albert Born are superb. The guitars make a death metal racket at times but also pick out the Iced Earth-like melodies with some Maiden thrown in. Honestly, this is unusual stuff. There are blast beats, rolling bass drums and more traditional tempos (often with very quick bass drums too, mind). In short, if you like any of the aforementioned bands then you may well like this. The closest thing I have heard recently would perhaps be Visigoth- but that is trad metal with modern production heft and elements of doom and thrash: this is a much more schizophrenic proposition. ‘A Priori’ has guest musicians, piano, strings.... things get very European over its two minute playing time as it acts as a bridge leading to the acoustic intro of ‘Sangreale’ before things get balladic and, well, epic. These men truly were born with hearts of steel- the solos prove it while the grandiose arrangements hammer the point home. You don't find many (any?) albums with blast beats and this kind of ballad. ‘Cain's Agony’ is back to rocking business- but with dynamics and melody. On first listen, you cannot predict this record and for that I commend the band highly. The track gets very weighty as it evolves with accompanying high notes and frenetic riff structures. It has the drama of something off Painkiller by the mighty Priest, but again things change up. ‘Sands of Nod’ has some lovely bass in the mix, courtesy of John Batease bringing to mind late period Death, but with soaring vocals bringing to mind Manilla Road or similar... before the blasting gets underway. Maybe this would be what Iron Maiden sounded like if they formed now?! 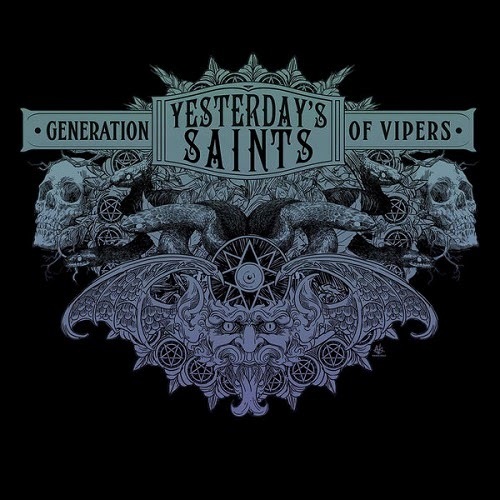 ‘Generation of Vipers’ is heavy and grand- the murk of the opening riffing cut cleanly by a soaring vocal from Matt Rice. One of the weightier tracks on the record and with lovely guitar work from Witt Black throughout. ‘The Divine Tragedy’ has rather a melancholy approach to the opening which works well and acts as a nice balance to the aggression of the riffing that follows. Again, it's heavy and epic at the same time. ‘Recursion’ is eight minutes of dynamics, changes and a fine demonstration of all the strengths and unique selling points of the record in one track. ‘Luctus En Mane’ finishes the record with guests and sound effects with strings and piano. This is a bewildering and excellent album. Unusual, for sure, but with enough reference points for fans of most sub genres to find something to enjoy here. If you like any of the genres or bands mentioned, definitely give this a try as it gives back what you put in. A fine work.